Go: How Outdated Are Your Dependencies? 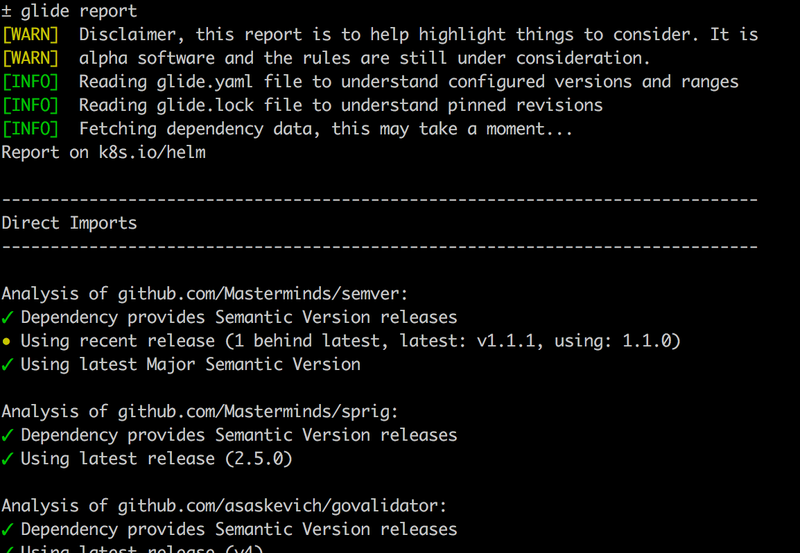 Wouldn't it be nice to know how up to date your Go dependencies are? In some languages there are tools that cover this. In some cases they go so far as to look at security reports to know where there are security issues in dependencies. A good example of this is David which provides insight into Nodejs projects. I wanted something similar for Go. Without going to the same extent as David, at this point, I'd like to present Glide Report. Glide Report, which is a plugin for Glide that currently works stand alone as well, will scan a codebase, look at repositories, gather information, and provide a report based on some rules. This will generate the report and copy the report, skipping the informational messages, to the clipboard. The output, which you can see the beginning of below, will show the difference between direct and transitive dependencies. For examples you can see reports on Kubernetes and runC. What If You Don't Use Glide? This will detect missing glide.yaml and glide.lock files. It will then attempt to create them without making any alterations to your vendor/ folder. If that's successful it will generate a report. This is just the start. Being able to gain insight on our Go dependencies is useful and we can do more. If you'd like to contribute to Glide Report we'd love to have the contributions and feedback. I also hope other tools come along in this space. There's ample opportunity and I look forward to folks jumping on it.